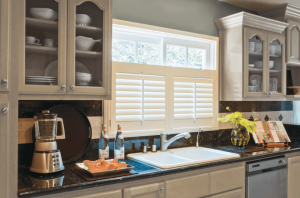 Cafe style shutters are available in a wide range of colours so that they can blend seamlessly into your external systems. The shutters can be used for ground floor bedrooms where there is no risk of anyone overlooking the top part of the window. This allows light to penetrate the top part of the window while offering stylish and practical privacy. All of our standard colour options are available however a customer painting service is available upon request. Unlike our full height shutters, the beauty of café style shutters is that they only cover the bottom half of the window. So even with added privacy for your home, you can still enjoy the warming glow of the summer sun, filtering into your home.